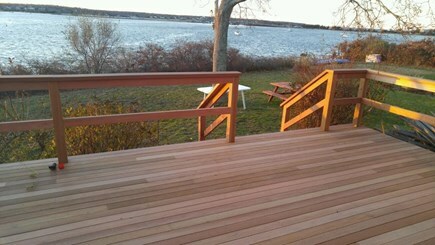 New 33x12 mahogany back deck faces the water, has table & chairs. Enjoy lovely sunsets across the water from deck and living room. See past Vineyard Haven harbor to Woods Hole. 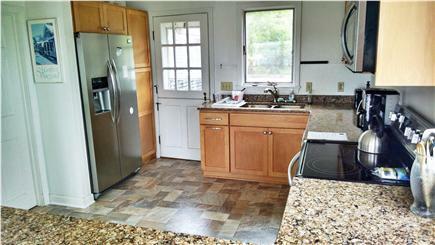 This commodious year-round L-shaped ranch is ideal for 2 families. Both the waterfront bedroom and a master bedroom have a queen bed and cable tv. Living room has HD flat screen tv and entire house has Hi-speed Internet. Back bedrooms are private from main part of house. Has outdoor shower. Large deck is shaded by unique old oak in one corner. Lawn slopes down to private sandy beach at your backyard. We are about 1/3 mile from opening of lagoon to Vineyard Haven harbor at the drawbridge. 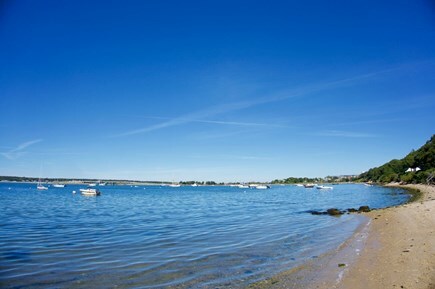 Warmer and calmer than the ocean, the lagoon is 3 miles long and 1 mile wide opening into Vineyard Sound. Ideal for swimming in calm water, kayaking, sailing small sailboats, windsurfing, etc., all rentable across the water. Near golf and tennis. House is at end of short private sandy road. Just bring linens. We supply all else. Many repeat renters! We have ferry tickets for most summer weeks! House is the L shaped ranch with gray and brown roof at end of the road overlooking the water on Google satellite map at right. Additional pricing info: I can put auto ferry tickets in your name at cost if you commit min 45 days before occupancy, State and local taxes of 11.7% will apply. House is a ranch, all on one floor. We have stayed at this wonderful house for two summers - you can't beat the location. Great little quiet beach, you can clam, kayak, rent windersurfers and paddle boards across the lagoon, swim, and play on the beach. Nice little yard for kids to play on, great big deck for watching the sunset while barbequing. We slept 8 adults and 3 kids without a problem. Very nice kitchen and living room, and you can bike to anywhere. We come every year sometimes with our children and sometimes without and absolutely love it. 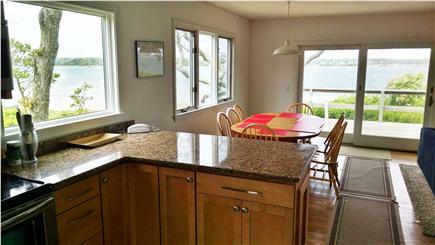 The beach is beautiful and private, the views are amazing, and house itself is spacious and lovely. I have nothing negative to say about this house! We love it. It is also a short bike ride to the State Forest or Oak Bluffs Center. Perfect vacation spot - can't recommend it enough. It is a dream vacation every year.